The combined revenue of associated companies has grown by 150% during 2016 (estimated, non-audited). A 284% audited increase in valuation, amounting to 13,6 MEUR, was made to Cleantech Invest’s book value of Enersize, Sofi Filtration, Nocart and Nuuka Solutions shares. During the year Cleantech Invest focused resources on accelerating portfolio companies growth. Cleantech Invest started expanding its international footprint by establishing Pop Up offices in Berlin and Los Angeles. Cleantech Invest increased resources in communication and established multiple communications platforms to increase its communication reach. Cleantech Invest changed governce and moved into a board with majority of independent board members. Cleantech Invest managed several follow on investment rounds in portfolio companies. In Nocart, a previously given loan was converted and new capital of 5MEUR was also brought into the company during the year, through a SPV founded by Cleantech Invest. In Watty, Cleantech Invest arranged a 1MEUR investment into Watty through a Special Purpose Vehicle. The total round size was 3MEUR and was joined by EQT Ventures. Cleantech Invest ownership changed from 1% to 4%. Cleantech Invest invested in ResQ Club Oy, trough direct investment and share swap with the founding team. Ownership after the transaction was 8.7%. Cleantech Invest listed its shares on First North Stockholm, made a directed share issue which was subscribed 3.5 times and attracted 12MSEK from more than 1233 new Swedish shareholders. Nocart won break through-contracts for 12,9 MEUR off-grid power plants in Africa and more than three-folded revenues during the year to 12,4 MEUR with a very strong positive result of 3,4 MEUR (non-audited). Enersize signed its first contract with a major Chinese vehicle manufacturer, and received their first bigger payment based on accomplished energy savings from one of the worlds largest flat screen manufacturers. Sofi Filtration concluded 11 new industrial client installations, and the full year 2016 revenues approximately doubled. Sofi also began targeting the US market during the year setting up their own test center in Texas. Watty secured around 3MEURO in investments from amongst others EQT Ventures and Cleantech Invest. Cleantech Invest made a directed share issue of approximately 750.000EUR to enable additional add-on investment in a fast growing portfolio company. The excercise period for Cleantech Invest subscription warrants ended resulting in an exercise rate of approximately 51,5 % and 4,3MSEK to Cleantech Invest before transaction cost. Cleantech Invest arranged 5MEUR investment into Nocart through a Special Purpose Vehicle and through direct investment from selected strategic investors. Cleantech Invest received a transaction fee of 215kEUR for managing the funding round. Cleantech Invest participated in Swap.com’s investment round through a Special Purpose Vehicle. Ownership at the end of the year in Swap.com was 5,5%. Nuuka increased the number of buildings connected to the system, from 537 to 916 and have since kept growing. Enersize announced two installation contracts and plans to list the company on First North Stockholm during H1 2017. ResQ Club reached 100.000 sold meals over the platform. Nocart closed 5MEUR in funding. Watty announced the launch of its next generation product at SLUSH, targeted directly to end users and received mentions in DI, Breakit and Wired. Swap.com kept growing, and is with more than 1.5m items for sale the largest online consignment store in the USA. The company attracted approximately 30MEUR in funding during 2016 and the monthly sales have now passed a level that corresponds to a yearly sales level of 20 MUSD. *Please note: A reduction of value amounting 295 kEUR (575 kEUR) was made on the valuation of Savo-Solar Oyj’s shares, which negatively affected the Profit and Loss. An increase in an amount of 194 kEUR was made on the valuation of Cleantech Future Fund, which positivey affected the Profit and Loss. What a year! We went into 2016 having strong revenue growth in a majority of our portfolio companies and the growth has continued throughout the year. We have focused on acceleration of our best performers with spectacular results, increased our global reach through recruitment of top class international board members and the launch of multiple communication platforms as well as Pop Up offices in Berlin and Los Angeles. As I pointed out in our half-year report, the main risk that remained for many of our companies was to secure an adequate amount of growth capital and top quality human resources to capitalize on the growth opportunities ahead. We managed to successfully complete funding rounds in Swap.com, Enersize, Nuuka, Nocart, Sofi Filtration and several others during the year and saw continued strong revenue growth as our companies executed on their plans. Several of our top performers were able to add crucial recruits in top management positions and we were involved in several of these recruits. I believe it is fair to say that we have simultaneously continued rapid growth, reduced the risk and increased the value creating potential of our combined portfolio during the year. Our portfolio completed six funding rounds during the reporting period and four during Q1 2017. Combined they attracted more than 40 MEUR in new equity to their balance sheets. I am proud to say that we still managed to keep our ownerships in the high performers well during this extremely active financing year. This is partly due to taking part in funding rounds through Special Purpose Vehicles, where our ownership is based on taking full responsibility for raising funding through holding companies, and partly due to being able to increase our ownership at pre-set valuations of convertible loans. Revenue growth of our portfolio has continued to be extremely strong. Combined revenues were up with 150% during the year amounting to approximately 33 MEUR at year end and it must be noted that this does NOT include the order that Nocart received just after the reporting period amounting to 200 MUSD. As we predicted for this year, two of our companies passed +10MEUR revenues last year and it has been a year when several of our companies have gone from early commercialisation to market scale-up after successfully proving their customer case. Several have also gone from domestic market focus to building international operations. Nuuka experienced strong growth in the number of buildings connected to their system (now approximately 1000 buildings) and started international growth, Enersize secured several major new energy efficiency contracts with very large factories in China while also securing globally renowned strategic investors in Scania and Durr (in Q1 2017). Sofi Filtration did ten new installations of their self-cleaning water filter, which is more than the company has done combined during its five years of existence. Our new food rescuing company ResQ went from nothing to selling a combined number of 110 000 meals of over its platform during this year, and are now present in Finland, Sweden, Netherlands, Estonia and Germany. Renewable energy company Nocart is simply a different animal now compared to last year. They won break through-contracts for 12,9 MEUR off-grid power plants in Africa and more than three-folded revenues during the year to 12,4 MEUR with a very strong positive result of 3,4 MEUR. They have fully owned subsidiaries in Kenya, Zambia, Singapore and the United Kingdom, giving them a front seat at opportunities in those markets where local presence (including staff and technology) are required, they have secured orders of more than 200MUSD and have a pipeline of potential projects that is close to 1BN EUR. Swap.com has also grown into a much larger suit during the year. They have continued to grow and now has more than 1.5 million items for sale, which means that the company holds by far the largest selection of products in online consignment the USA and the monthly sales have now passed a level that corresponds to 20MUSD yearly sales. The company also secured approximately 30MEUR in new equity funding during the year. The past years result reflects the focus we have had during the year: getting several of our companies ready for listings and potential exits. We have spent more on resources to accelerate our companies, as we have deployed external resources into several of them. We have also helped several of our companies make big improvements in the way they communicate. We have been able to invoice some of these costs as advisory services, and we have also received revenues from completely managing a number of funding rounds for our companies during the year, so we have increased revenues from advisory services and transaction fees. I can’t hide my excitement over the value that these offices have already brought us since announcing the initiative in June. There has been a moderate increase in costs related to these offices but the tangible results of having them have been everything but moderate. Enersize now has strategic new German owners in Durr Investment AG, ResQ Club has new Berlin-based owners, Nuuka and several other have identified distributors and partners in the the US, and Cleantech Invest now has new shareholders from California and Germany. All as a direct result of us being present in our pop-up locations and we do believe that there is more to come. We believe that our pop up activity can be an extremely powerful and cost efficient way too to accelerate companies and create value, likely to be copied by other investors/accelerators. During the coming year we are looking at the possibility to do this on new geographical markets. One of the places we are currently investigating is Shanghai. Similarly, the parallel listing in Sweden that we carried out during the year has been a very positive experience. The listing issue was subscribed 3 ½ times, and we got thousands of new shareholders, but more importantly we have gotten a lot of new investor contacts for us and for our portfolio. The listing does take some additional face time from the CEO, adds some communication costs and some admin but these are things we happily do as the value is clearly outweighing them, even more so as Stockholm since our listing has even more so become the leading European financial center for growth companies. I stated already in the half-year report that harvest time is approaching. We are now closer to it. We have prepared two of our companies for listing on First North Stockholm, both are on track to do so and we are happy see significant investor interest for our IPO candidates. We have also accelerated the development in other firms to a level that means partial exits are potentially possible. Accelerating a new batch. As several companies that took a lot of our resources have taken off we have selected a number of companies in our portfolio where we now put in more resources. Eagle Filters is one such company, where we have increased our ownership significantly and see a big potential for increased revenues. We also plan to bring in some new companies into our portfolio in a very controlled process. Communication to the next level! If you follow our company you will have noticed that we are increasingly active in communicating the results of our portfolio as well as pushing for the type of ecosystem-strengthening business landscape that we want to see. In addition to regulated press releases our communication platforms include newsletter, facebook, twitter, instagram, medium, soundscloud and linkedin. Engage with us on our platforms to get the most comprehensive picture of what is happening. We have a number of planned communication activities for the coming year. One is calculating and clearly communicating the positive environmental impact of our portfolio. The numbers are being crunched as I write this, and the results will be nothing short of breath-taking so if you do not follow us yet, start doing so! We have stated that we will be the leading European Cleantech Accelerator at the end of this year. Technology cost-curves are now fundamentally changing how energy and natural resources are produced and used. We believe that entire new cleantech industries are currently being built, such as online sales of pre-owned consumer goods, the negawatt industry of energy efficiency, and resource efficiency through sharing. We believe that the bluechips of the future will be found in these industries and we believe that our portfolio is well positioned to play a leading role in the emergence of these. We will reach our goal and already look forward to telling you what our next steps will then be. *Ownerships in PlugSurfing GmbHand Swap.com are slightly higher from the ownerships published previously in releases. **Includes employee options but not possible investor options. Cleantech Invest briefly comments on all of the associate companies’ business development during the financial period. Please note that All mentioned ownership percentages in this report are effective and fully diluted ownership percentages, unless otherwise stated. A key indicator may also be disclosed that describes the development in the associate firm. Associate companies are divided into two groups: 1) Energy and Resource Efficiency; and 2) Decentralized Renewable Energy. 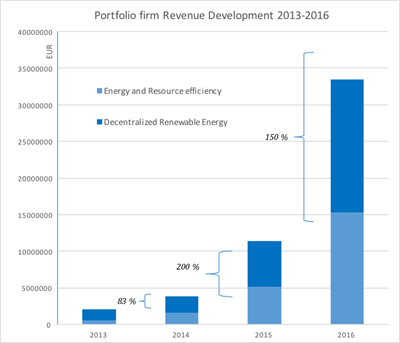 The combined revenue of the associated companies was 33,4 MEUR in 2016, which comprised: 15,3 MEUR for Energy and Resource Efficiency; and 18,2 MEUR for Decentralized Renewable Energy. The combined revenue of associated companies has grown by 150% during 2016. All associate company revenue figures except for Savo-Solar Oyj and Enersize Oy for 2016 are estimated and non-audited. Swap.com launched their men's apparel line and a mobile iOS client in summer 2016. The company closed a funding round of 19mEUR in December 2016, led by Swedish eEquity. Altogether, Swap.com raised 30mEUR in new equity funding during 2016. Last two quarters of 2016 were strong growth quarters for Nuuka. The company was able to increase the number of buildings using its software for managing building data from roughly 500 to 900 buildings at year end. Nuuka also signed its first major customers in the Benelux and developed new software modules for key segments including cooling monitoring and analytics modules for supermarkets and groceries. Nuuka has agreed to start a major project in China, together with its Chinese partner Zhejiang Zhongrui Low-carbon Technology Ltd.
Nuuka´s sales pipeline is bigger than it has ever been and the company is expecting to continue adding buildings using Nuuka not only in the Nordics but also in other key markets. Nuuka is planning to increase its resources and recruit new key personnel to accelerate its international growth. Indicator for Nuuka Solutions: Nuuka experienced strong growth in the amount of buildings connected to Nuuka’s service platform as the amount of buildings served by Nuuka almost doubled. End of the reporting period there were 916 buildings under contract. Sales levels of Eagle Filters have during the end of 2016 almost resumed to the level prior the factory fire that seriously affected company operations during end of 2015 and beginning of 2016. Eagle Filters has developed and applied a patent for a new product for gas turbine air filtration markets which will increases the potential target market size significantly. Enersize, Cleantech Invest’s largest holding in terms of ownerships percentage, had a strong year. The company entered into partnership with a second Chinese sales and implementation partner which created a rapid and significant increase in the already large offer pipeline. Enersize sales pipeline with ongoing customer nego­tiations in China doubled over the year. The company signed its first contract with a major Chinese vehicle manufacturer, Foton Beiqi Motor. The total estimated income for Enersize for this project is 0.25 MEUR, with payments expected during 2017. Enersize also announced two new installation contracts with two different Chinese glass manufacturers during 2016. In Q4 the company announced that they plan to IPO on First North Stockholm during Q2 2017. Metgen has secured two customers in the Pulp and Paper industry and reached sales agency agreements for Central Europe and Korea. The company has added 3 new products to the portfolio for biorenewable sectors and has found a new application area for existing products in the biogas field. Metgen has also filed 5 new patent applications. Indicator for Metgen: Number of new products / product applications grew from 8 in the beginning of 2016 to 12 by the end of 2016. Oricane has continued developing the services- and technology license business with Datacom equipment manufacturers. The company secured a non-exclusive license agreement with California based company MoSys during the year and is also directly addressing other players in the eco system such as FPGA vendors and micro- and network processor manufacturers who provide key components to Datacom manufacturers. The company also worked on consultancy basis as well as signed a support agreement with another Tele and Datacom manufacturer. Plugsurfing has continued growing their user as well as charging station network during the year and launched a new app on both iOS and Android. The company signed a contract with charging solution provider Allego to provide charging sessions to Nissan dealerships in Germany, and became an official supplier to Tesla, a 'preferred partnership' agreement which now includes Belgium as well as Germany. Plugsurfing also experienced remarkable growth in charging sessions, which more than doubled during the year. ResQ grew the provider base to over 600 food outlets globally, and the number of registered users to over 60,000 during the year. The ResQ Club service reached the threshold of 100,000 resQ'd food portions in November of 2016. The company rolled out new payment methods and the possibility for users to purchase “ResQ credits”in the service for future food purchases as well as a new look of the brand to both interfaces and marketing material. ResQ hired significant new talent on the marketing side: a new experienced and entrepreneurial CMO as well as new experienced Community Managers for the Swedish and German teams. The company just completed the possibility of signup and login via Facebook, a critical function to smoothen the process of on-boarding new users. 2016 was the first full year of real sales for Sansox. The company has done successful pilots in the field of fish farming during the year and has worked on establishing distribution networks for South America. The company also signed a contract for distribution on the Chinese market, specifically for the Pulp & Paper business area. The partner is a market leader in providing technologies to this market segment able to introduce the technology to multiple suitable customers. Sofi Filtration concluded 10 new industrial client installations during H2 2016, and full year 2016 revenue growth rate compared to previous year was approximately 100%. Sofi began targeting the US market during the year setting up their own test center in Texas during 2016. First pilots are planned for the North American oil & gas water treatment market. Sofi has also taken first customer contacts and researched the Scandinavian markets for replicating the success in Finland. Indicator for Sofi Filtration: Offer base 01.01.2017: 0.6 MEUR. In the end of 2016, at SLUSH, Watty announced the launch of its next generation product, targeted directly to end users and received mentions in DI, Breakit and Wired. Watty secured around 3MEUR in investments from amongst others EQT Ventures and Cleantech Invest in summer 2016. Watty has also built a sales and marketing team aiming to set the focus on building a leading brand, identifying and launching collaborations with relevant partners to reach the company’s ambitious growth targets. Nocart continued to develop a strong sales pipeline as well as developing their product offering during the year. There was increased activity in Africa, particularly Zambia, Kenya, and Gambia. Previously reported projects in Nigeria and Malawi continued to progress. A number of domestic European projects also produced revenue during the year. Opportunities in Asia were actively researched. Nocart has continued to develop its gasification process, and is looking to introduce new products in 2017 including fixed and portable container-based systems, as well as more aesthetically pleasing solar system designs in smaller projects. Nocart continues to work with its suppliers to ensure its highly cost effective and high quality component sourcing, enabed by scale. Nocart will look to engage in pre-financed commercial deals with the opportunity to participate in power revenue in addition to the initial sales of equipment. This is in line with the overall strategy of gradually becoming a power provider, in addition to equipment sales. Nocart’s global reach has expanded during 2016/17. There are now wholly owned subsidiary companies registered in Kenya, Zambia, Singapore and the United Kingdom, giving Nocart a front seat at opportunities in those markets where local presence (including staff and technology) are required. Nocart is using consultants with experience in due diligence, government relations, finance and hybrid technology to ensure that all projects are adequately researched and costed. Nocart has during the year adopted a Business Integrity Policy and Corporate Social Responsibility Policy to ensure that all Nocart staff and the organizations the company works with are maintaining responsible and ethical business practices. One1 has opened up its new business area - energy selling. The first customer, municipality of Hollola, is now buying heat and cooling to the new school and kindergarten. One1 made a 20 year contract for selling heat to 6 different buildings to the municipality of Masku. The total value of the contract is 7 MEUR. A third agreement during the year was made with Pori Energia for selling heat to a Kindergarten owned by the city of Pori. Altogether the value of these energy selling contracts are 8,3MEUR. One1 sold its first solar power system to Lahti Energia sized at 46 kW. Indicator for One1: One1 installed heating capacity at customer and own sites is 2,2 MW. During the second half of 2016 Savo-Solar continued investing in capacity increase and efficiency in line with its growth strategy. Due to extensive development of the manufacturing process the working hours per collector were decreased by more than 70%. The updated coating line will double the coating capacity and the introduction of automatization will increase both the capacity and the efficiency of product assembly. Favourable trend in tenders and market recognition continued mainly based on successful deliveries and good feedback from major customers in Denmark. The solar collector field installed at Jelling Varmevaerk, Denmark, showed excellent performance breaking the Danish records in measured efficiency. Savo-Solar won tender for first turn-key delivery to Sweden and the final negotiations of the contract details are on-going. Savo-Solar intensified the sales and marketing efforts in Europe and additionally on the market outside Europe. The company’s strong position in the Danish market serves as an excellent reference in other market areas. In order to ensure continued strong growth of its business Savo-Solar arranged a rights issue in September 2016. As the interest in the rights issue was stronger than expected, there were further directed share issues and the company raised approximately EUR 5.8 million in net proceeds. Aurelia Turbines is changing from product development to deliveries. The company has signed several agreements for delivery of its A400 turbine. Deliveries are scheduled for later part of 2017. The company's revenue in 2016 was 395,886 EUR (1-12/2015: 248,685 EUR). The revenue increase was due to increase in fundraising and managament related consulting projects for portfolio firms. Materials and services expenses in 2016 were 216,414 EUR (63,010 EUR). The increase was due to increase in marketing and communications efforts within Cleantech Invest and also external consulting services purchased in support fo portfolio development. Personnel costs in 2016 amounted to 522,696 EUR (596,878 EUR). Other operating expenses totalled 571,332 EUR (329,145 EUR). The increase was due to Stockholm First North parallel listing expenses, establishment of pop-up offices in Berlin and Los Angeles, marketing expenses and increase in travel costs. Depreciation, amortization and write-downs of intangible and tangible assets in 2016 were a total of 170,693 EUR (131,801 EUR). The company’s operating loss for 2016 was 1 085,250 EUR (872,150 EUR). The increase in loss was due to increase is materials and services expenses and other operating expenses as detailed above. Financial income in 2016 was a total of 50,217 EUR (68,252 EUR) and financial expenses were a total of 101,331 EUR (501,465 EUR). Financial expenses included the write-down amount 294,752 EUR of Savo-Solar Oyj and increase amount 193, 751 EUR of Clean Future Fund. A further 90,578 EUR expense was due to the difference of original purchase price and sales prices of Savo-Solar shares sold during 2016. The net loss of the year 2016 was 1,136,957 EUR (1,306,274 EUR). In 2016, the company successfully carried out a parallel listing and a share issue in April, seeing 1233 new investors mainly from Sweden investing into Cleantech Invest. The investment was done as an emission of 1,290,320 new Series A shares. In July 2016 a directed share issue with a size of 873 kEUR was carried out. In the offering, 793,271 new class A shares were offered at the subscription price of EUR 1,10per share. The reason for the offering was to have the ability to make an add-on investment in a fast growing portfolio company. In November 2016 subscription warrants issue that was part of the First North Stockholm listing in the spring opf 2016 was carried out. In total, 664,848 subscription warrants were exercised, meaning that 332 424 new A-series shares were issued. The subscription price was 13 SEK per share. The balance sheet value of the investments amounted to approximately 19,7 MEUR. During 2016 the two biggest investments were made in Swap.com and Nuuka Solutions. A revaluation amounting in total of 13,6 MEUR was made to the value of Enersize, Sofi Filtration, Nocart and Nuuka Solutions shares during the period. A reduction of value amounting 295k EUR was made on the valuation of Savo-Solar Oyj’s shares, which negatively affected the Profit and Loss. A reversal of impairment charge made on the previous periods was made to the valuation to the shares of Clean Future Fund. The positive effect arising from this reversal to the Profit and Loss for 2016 was 194k EUR. Swap.com: Cleantech Invest portfolio company Swap.com (Swap.com Services Oy) closed in December 2016 a 19M€ investment round. The round was led by eEquity from Sweden and joined by other investors. The effective ownership of Cleantech Invest Plc in Swap.com was 5.5% after this investment round. Cleantech Invest Plc and all of its affiliated companies own a total of 16.1% of Swap.com end of 2016. The ownership does not take into account possible dilution from performance based options. ResQ Club: Cleantech Invest made an investment in ResQ Club by subscribing new shares in the company representing 6.5 % of the shares after the investment. In addition, Cleantech Invest entered into a share exchange agreement with two of ResQ Club’s current shareholders, to further increase its shareholding in the company by approximately 2.2 %. After the investment and share exchange, Cleantech Invest owns 8.7% of ResQ Club. Enersize Oy: Cleantech Invest participated in an investment round in Enersize during H2 2016. After the investment round, Cleantech Invest owned 38,6% of Enersize. Nuuka Solutions Oy: During 2016 Cleantech Invest participated with an equity investment in two financing rounds in Nuuka solutions. In the latter financing round that took place in December Cleantech Invest also converted loans to equity in the firm as part of the financing round. In the beginning of the year Cleantech Invest owned 34% in Nuuka (fully diluted). After the equity investments and loan conversions, in the end of 2016 Cleantech Invest owned 38,8% of Nuuka Solutions (fully diluted). Nocart: In June 2016 Cleantech Invest increased its ownership to approximately 21,5% from 20% by converting a loan in portfolio company Nocart. In December 2016 Nocart Oy signed a 5M€ investment round. Investors included Cleantech Invest SPV 5, and two Finnish family offices. The effective ownership of Cleantech Invest in Nocart was 19.3% after this investment round. Cleantech Invest and all its affiliated companies own a total of 21,4% of Nocart after the transaction. Watty: Cleantech Invest SPV 3 AB made an equity investment of 1MEUR into Watty as part of a 3MEUR investment round in July 2016. Cleantech Invest Plc owns 23% of the holding company and the effective fully diluted ownership of Cleantech Invest Plc in Watty rose to 4% from 1%. Aurelia: In February 2016 Cleantech Invest participated in an equity round in Aurelia Turbines. The fully diluted ownership of Cleantech Invest Plc in Aurelia after the round was 3,4%. Alexander ‘Bigge’ Lidgren acted as the managing director of the company during the financial period. In addition to the managing director, the company employed 3 staff (Tarja Teppo, Lassi Noponen and Timo Linnainmaa) who together formed the management of the company. In the beginning of the financial period the board of directors consisted of Lassi Noponen (chairman), Tarja Teppo, Jan Forsbom, Thomas Bengtsson and Timo Linnainmaa. On the 20thof April 2016 James Penney, Peter Carlsson and Matti Vuoria were appointed as new members to the board of directors. On the same date Tarja Teppo, Jan Forsbom and Timo Linnainmaa resigned from the board. Since the 20thof April 2016 the board of directors of the company consisted of Lassi Noponen (chairman), Thomas Bengtsson, James Penney, Peter Carlsson and Matti Vuoria. General risks concerning the business environment of Cleantech Invest Plc are related to recent macroeconomic and capital market uncertainty. The associate companies of Cleantech Invest are start-up companies, and there are remarkable risks involved both in their business operations and through investments in them. It is uncertain that Cleantech Invest is able to sell its holdings in associate companies in a profitable way or that the sale is possible in a planned schedule in line with the company’s strategy. Due to the nature of Cleantech Invest’s business environment, success in collecting finance for the associate companies’ operations is of utmost importance. The risks related to the company’s business have been described in detail in the listing prospectus dated 2 May 2014, which can be found (in Finnish language only) on the company’s website (http://frantic.s3.amazonaws.com/cleantechinvest/2014/05/Cleantech-Invest-Oyj_listautumisesite.pdf). The investor memorandum for First North Stockholm listing dated February 2016 contains an overview of the risks related to the company’s business (in Swedish language only). The investor memorandum can be accessed via the company’s website (http://www.cleantechinvest.com/files/Memo-Cleantech-Invest_Oyj_febr_2016.pdf). An update to the memorandum was made in August 2016 which can be found here http://www.cleantechinvest.com/files/Supplement_to_the_company_description_of_April_2016_released_9.9.2016.pdf. There are no major changes in the risks and uncertainties since the date of Stockholm listing prospectus. However, the financial position of Cleantech Invest has improved based on the successful share issue in connection with the listing on Stockholm First North in March 2016. The outlook for certain associate companies has brightened when they have succeeded in gathering financing and acquiring new customers, thereby sharing the revenue risk. On the other hand some of the associate companies have not reached their targets as to financing and customers and it should be noted that several rely on successful funding rounds within the next six months to achieve their growth potential. To achieve our goal of becoming Europe’s leading cleantech accelerator by the end of 2017 we will continue to focus primarily on the acceleration of our companies. This means making sure they have the right tools and resources to grow. We will do this with our increased human and other resources. Two of our portfolio companies have announced IPO plans in 2017 – Enersize and Nuuka. We look forward to successfully completing these IPO’s and we don’t rule out the possibility of partial exits from our portfolio companies during the coming year. We will also continue to evaluate all possibilities for value creation as we have announced earlier in our strategy update. The Nordic area combined is a clean technology growth engine of the world, rivalled only by California. We look forward to strengthening our Nordic identity and bringing in more Nordic partners and stakeholders. We also look forward to solidifying our global footprint in the future. This means greater geographical reach to support growth and more international investors and communications. We will also further develop our focus on stakeholder communications through various media platforms as well as the development of our portfolio companies’ own communications and media activities with the key hire of a Head of Communications for Cleantech Invest. We continue to have an unprecedented inflow of high quality companies to invest in. We aim to carefully launch a second wave of early stage investments, and we are often welcomed as the first choice investor for these companies. Our goal is to always provide our sharholders with a diversified portfolio of the most interesting Nordic cleantech growth companies in different stages of development. Cleantech solutions are increasingly becoming synonymous with the most economically viable solutions, and Cleantech Invest focuses on companies that are not reliant on subsidies or public sector support for revenue growth. Despite anticipated changes in federal US environmental policy, at large policy support remains strong for companies that are solving environmental problems. Regulators are now influencing cleantech markets with more overarching policies, as individual cities announce bans on diesel cars, and countries proclaim a ’no coal’ strategy, giving a substantial boost for clean technologies. Nations, industries, communities and consumers are increasingly focused on finding environmentally sustainable products, services and solutions. Our focus areas in energy- and resource efficiency and renewable energy continue to gain momentum and policy risk has continued to shift towards conventional, more polluting actors and technologies. We expect macro trends to benefit the operating environment of Cleantech Invest’s business strategy moving forward. Last year was a year of great progress for many of our portfolio companies and we expect the same strong development to continue, particularly for Swap, Nocart, Enersize, Sofi Filtration, ResQ and Nuuka Solutions. We also expect to begin seeing positive results from the acceleration of Eagle Filters. Some other firms should also have positive developments but we also know from experience that not all companies will succeed in their efforts and may have negative developments. Overall we expect 2017 to be again another good year for Cleantech Invest. Macro trends strongly favor the development of our portfolio, we believe that entire new cleantech industries will emerge and many very valuable cleantech companies will rise and become the ‘Blue Chips’ of the future. We aim to play a large role in this industry transformation and capitalize on this according to our strategy. The Annual General Meeting of Cleantech Invest Plc was held on the 20thof April 2016 in Helsinki. In addition to the issues stipulated in paragraph 5:2 of the Companies Act the shareholders meeting also resolved on on amending the articles of association and authorized the Board of Directors to decide on acquisition of the company’s own shares. At the beginning of the financial period the company had a total of 19,343,707 shares, divided into 5,450,000 Series K shares and 13,893,707 Series A shares. Class A shares have one vote at shareholders’ meetings and class K shares each have 20 votes at shareholders’ meetings. In February 2016 300.000 K-shares were converted to A-shares. After the conversion there were 5.150.000 K-shares and 14.193.707 A-shares. In March 2016 a share issue was carried out in connection to the First North Stockholm parallel listing and 1233 new investors invested into Cleantech Invest. The emission was subscribed for over 3.5 times. The investment was done as an emission of 1.290.320 new Series A shares that were registered in April 2016. After the share issue there were 5.150.000 K-shares and 15.484.027 A-shares. In July 2016 150.000 K-share swere subscribed for with options. After the subscription there were 5.300.000 K-shares and 15.484.027 A-shares. In July 2016 a directed share issue where 793.271 A-shares were issued was carried out. The directed share issue and a share swap that was carried out in connection with investment into ResQ Club, amounting to 41268 A-shares, were registered in September 2016. After these two transactions there were 5.300.000 K-shares and 16.318.566 A-shares. Also in September 2016 730.969 K-shares were converted to A-shares. After this there were 4.569.031 K-shares and 17.049.535 A-shares. In November 2016 a subscriotion warrants issue using warrants issued in connection with the First North tockholm listing in spring 2016 was carried out. 332.424 A-shares were subscribed for with the TO 1A subscription warrants. After the share issue there were 4.569.031 K-shares and 17.381.959 A-shares. Accordingly, at the end of the financial period 2016 the company had a total of 21,950,990 shares, divided into 4,569,031 Series K shares, each having 20 votes at shareholders’ meetings, and 17,381,959 Series A shares, each having one vote at shareholders’ meetings. In addition, there are options that give a right to subscribe 2,293,936 Series K shares and options that give a right to subscribe 1,000,000 series A-shares. Taking into account the effect of dilution of the options, the number of shares amount to 25,244,926, divided into 6,862,967 Series K shares and 18,381,959 Series A shares. (31 Dec 2015: 21,787,643). Emission adjusted average number of shares was 20,868,919 on 31 December 2016 (31 Dec 2015: 18,563,707. Taking into account the effect of dilution of the options the emission adjusted average number of shares was 24,033,688 on 31 December 2016 (31 Dec 2015: 21,007,643). Cleantech Invest board members and the management team owned on 31 December 2016 a total of 1,291,203 Series A shares, 3,344,072 Series K shares and options that give a right to subscribe 1,854,028 Series K shares, taking into account all shares and options owned directly and indirectly through companies controlled or influenced by them or through their family members. The shares owned by board members and the management team represent approximately 21,1% of the company's all outstanding shares registered on 31 December 2016 in the trade register and 62,7% of the voting rights of the shares. Cleantech Invest had all together 3417 registered shareholders according to the shares register on 31 December 2016. 2220 shareholders were registered in Euroclear Finland and 1197 shareholders in Euroclear Sweden. The number of listed shares at the end of the financial period was 17,381,959 and the market cap on 31 December 2016 was EUR 29,2 million. When also taking into account the non-listed Series K shares the market cap was EUR 36,9 million. The closing price on the 31stof December 2016 was 1,68 € per share. During the financial period the highest price paid was 1,81€, the lowest 0,94€, and the volume-weighted average 1,35€ per share. During 2016 the Series A share had a liquidity provision agreement with FIM Bank/S-Pankki that fulfilled the NASDAQ OMX Helsinki Oy Liquidity Providing (LP) requirements. 332.424 new A-shares were subscribed using the options. Based on the authorization by the shareholders meeting granted on 9.3.2016, the board of directors has on 10.6.2016 decided on an option program for the key employees, under which maximum 1.000.000 new A-shares could be subscribed. 333.333 of these option rights have been marked as 2-2016A, 333.333 as 2-2016B and 333.334 as 2-2016C. The subscription time for the 2-2016A options is 1.7.2016 – 31.12.2025, for 2-2016B options 1.7.2017 – 31.12.2025 and for the 2-2016C options 1.7.2018 – 31.12.2025. The share subscription price based on these options is 1,00 euros per share. The subscription price will be added to the free capital of the company. 846.000 options have been allocated during the reporting period. In January 2017 Cleantech Invest portfolio company Nocart signed a 200MUSD supply contract for delivery of solar hybrid power plant to Zambia. Also in January Nuuka closed a pre-IPO round in preparation for listing on First North Sweden during 2017 and selected Mikko Valtonen as new CEO. Main investors of the round were Zhejiang ZhongRui Low Carbon Technology Co and Cleantech Invest. In February 2017 Cleantech Invest made a directed share issue of 2.6MEUR to institutional investors and investors of strategic value to the Company, in order to acclerate growth. In March 2017 Enersize closed a pre-IPO round of 1.2MEUR. The round was joined by strategic investors Scania Growth Capital and Berlin based Heinz Durr Investment. Cleantech Invest fully diluted ownership in Enersize after the financing round is 36.6%. In March 2017 Cleantech Invest executed a follow-on investment into portfolio company Eagle Filters. The ownership increased from 10 to 28%. In addition, Cleantech Invest has secured options to potentially increase its ownership to 40%. The 2016 annual accounts with management report and the auditor’s report are available on the company’s website at www.cleantechinvest.com/share-info/reporting . The Annual General Meeting will be held on the 21stof April 2017 in Helsinki. The invitation to the General Meeting was published on the 29th of March 2017. The Board of Directors proposes to the Annual General Meeting that the result be transferred to retained earnings / loss account and that no dividend be paid. The half-year report for the period 1 January – 30 June 2017 will be published on 31.08.2017. Q1 summary for the period 1 January – 31 March 2017 will be published on Friday 21 April 2017 and Q3 summary for the period 1 July – 30 September 2017 on Tuesday 31 October 2017. Annual accounts have been prepared following generally accepted accounting principles and applicable laws. The figures of the financial statement release have been audited and they are rounded from exact figures. The comparison figures in 2015 have been given in the brackets unless otherwise stated.